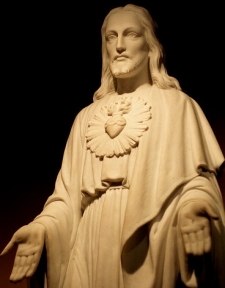 Our Superior General, His Excellency Bishop Fellay wishes to renew the Consecration of the Society of St. Pius X to the Sacred Heart of Jesus on Friday, June 15, the Feast of the Sacred Heart. This will be done in all our houses during Benediction of the Blessed Sacrament. His Excellency asks that this renewal be preceded by a novena, to start immediately this Wednesday, June 6. The novena is to consist simply in the daily recitation of the Litany of the Sacred Heart in all our houses for the intention indicated. The Society was first consecrated to the Sacred Heart in 1992, and this consecration was renewed in 1994. The circumstances in which we currently find ourselves bring us, at Bishop Fellay’s request, to renew it once again, imploring blessings and graces from Heaven for our dear Society. I would like to invite the faithful to join in this novena with the same generosity they have shown in the Rosary Crusades. I am honored and pleased to announce that the United States District prayed over 4 million rosaries in the most recent Crusade. I am grateful to all of you and convinced that this generosity will be source of many graces for the Society here in America. Please recall that 8 new priests, 6 for the Society of St. Pius X and 2 for Our Lady of Guadalupe Monastery, will be ordained in Winona on June 15. I encourage you to come in great numbers for this joyous event, and together with us renew the Consecration to the Sacred Heart requested by Bishop Fellay for that day. I assure you of my prayers and give you my blessing, in the Immaculate Heart of Mary and the Sacred Heart of Jesus.